Autumn shows this deciduous shrub at its best with huge, divided leaves and colourful, fleshy seedpods. 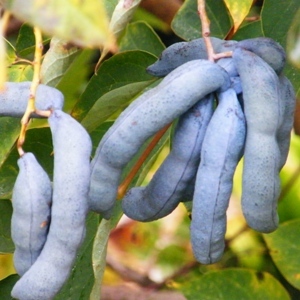 These are bright blue and finger sized which hang from the plant as the leaves turn an attractive butter yellow. The unusual seedpods are what gives this plant its common name ‘dead man’s fingers’. The flesh inside the pod is edible and rather sweet tasting, although, the plant is mainly grown for its ornamental value. A relative of Akebia the chocolate vine. It is native to Western China and the Himalayas, growing up to 3m (10ft) tall, with an upright habit when young, it becomes more rounded in maturity. It is hardy throughout Britain to -15ºC, and the silver bark on the stark branches also makes this an excellent plant to have in winter.